The ironic aspect of the modern, effects-laded action movie is just how chintzy expensive CGI can appear. A team of artists can produce the most seamless chase scene on a computer and it will still look like something made, well, on a computer. 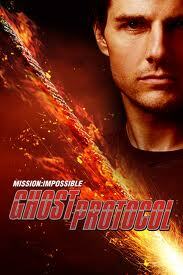 In this light, "Mission: Impossible - Ghost Protocol" is a throwback of sorts. That's not to say the fourth film in the "Mission: Impossible" series doesn't have its share of machine-made derring-do, it's that it combines CGI with real stunts, car chases and well-choreographed fight sequences. Where Michael Bay or George "Legacy Destroyer" Lucas drowns viewers in a polished sea of too-perfect computer graphics, "Ghost Protocol" director Brad Bird smartly splits the difference. For every occasionally sterile looking shot of Tom Cruise running from a green-screened explosion, there's a super cool scene of Cruise and his stunt double battling nuclear terrorists in a parking garage or climbing the glass-sheathed face of the world's tallest building. Action movies don't need bulletproof plots and realistic stunts to be good, clever fun. "Ghost Protocol's" winkingly ridiculous story about nuclear extremism is just window-dressing for the breathless transitions between spectacular set pieces and costume changes. Fans may question Cruise's personal life, but our little scientologist doesn't quail in the face of fast-paced filmmaking. Indeed, separating the art from the artist will allow us to enjoy extended segments of the star chasing down bad guys while wearing a form-fitting suit, his stumpy little legs pumping, the scented breezes of exotic Dubai streaming artfully through his foofy actor's haircut. The story, such as it is, revolves around Cruise's Ethan Hunt and the rest of his IMF team getting disavowed by the President after a disastrous attempt to stop a nuclear nutjob from stealing some launch codes. The team's unauthorized globe-trotting pursuit of what is a fairly stock movie terrorist is leavened by wit and some surprising character depth. Cruise and a game cast bring some nice chemistry to the explode-y proceedings. Simon Pegg's tech geek Benji is deservedly given an expanded role in "Ghost Protocol" after an amusing turn in "Mission: Impossible III." Pegg does his nervous, lovable English guy thing while franchise newcomer Jeremy Renner, as an intelligence agent roped into Hunt's world-saving antics, brings humor and some secret bad-assery into what could have been a one-note character. The hypnotically gorgeous Paula Patton could have been similarly typecast as the squad's token female, and while she looks great in a slinky party dress, Patton kicks her share of henchmen derriere, too. There's barely a scene without a chase, a fight, or the use of improbable technology. The action is ostentatious, but in good way. Every punch sounds like a sledgehammer striking a slab of meat, and the dizzying scene of Hunt clambering up the side of Dubai's Burj Khalifa hotel is an acrophobic's nightmare. "Ghost Protocol" is Pixar veteran Bird's first live-action film. He's no stranger to formulating extended set pieces, however, as "The Incredibles" contains some very well done (and surprisingly violent) action sequences. The cartoony effects of Bird's new cinematic spy game work in concert with the real stuff, and it makes for an enjoyable holiday popcorn muncher. The flick isn't a revolutionary entry in a genre that has been stale for years, but its spirited attempts at old-school, "analog" action puts "Ghost Protocol" a good piece ahead of its overly computer-generated contemporaries.